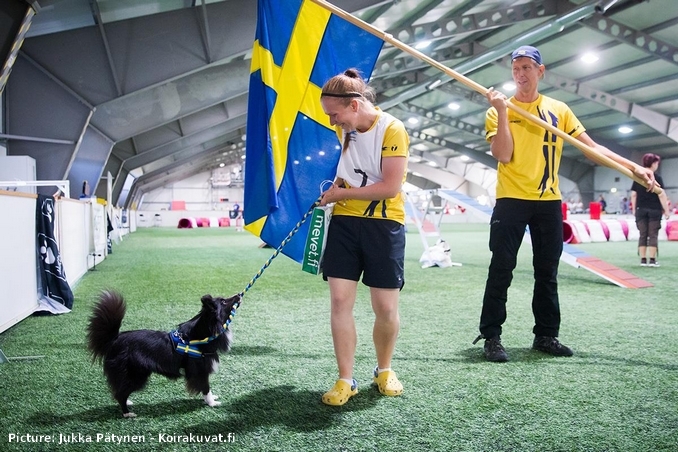 The countdown to the start of the Agility World Championship 2018 in Sweden is ticking inexorably. As a small foretaste and to bridge the waiting time until then, we have conducted an interview with Enya Habel. In a detailed talk with agilitynow.eu, the 24-year-old Swede gives us deep insights into her beginnings and explains how she was able to assert herself as a 16-year-old despite difficult circumstances. What first sounds like the typical story of a teenager with her first own dog turns out to be much more. Because Enya Habel is a fighter nature through and through, which sets all the levers and paths in motion when it must be. 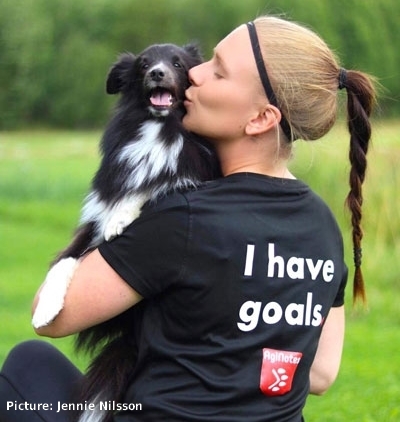 She also speaks to us about her first World Cup, her role as a favorite and the personal goals in Kristianstad. agilitynow.eu: In a week you will compete for the first time at a world championship. A lot peoples don’t know that 2018 is your premiere. Congratulations also from us at this point. Is this a long dream that has come true or what was going through your head after the qualification? Enya Habel: Yes! It’s crazy. The world championships has always been like an unrealistic dream for me but ever since last years tryouts I have been very determined to chase this dream. Party is my first dog on this level and she was already last year doing really good tryouts. Unfortunately she stretched a muscle the second day of the competition and we had to go home. What happened last year was devastating back then, but now I can really see how good it was for us to just play another year without demands or pressure. This year I was even more hungry and even more focused so it felt great to both complete the tryouts and take a spot in the team! agilitynow.eu: The expectations of a world championship in their own country are correspondingly high. Especially since Sweden is traded year by year as a favorit in the small competition. Are you thinking about the extra pressure or can you hide it before and during the run? Enya Habel: Just to get into this incredible small team was a big success for me. As you say, Sweden has amazing small dogs. The pressure is high and I think that’s good for the team, it makes us extra sharp. We have a great team spirit and after going home from the Nordic Championships with a superior win we gained a big confidence in our team. For me, I’m the only rookie in this team and I’m usually very good at finding my bubble of focus before my runs. But I have to admit that it feels great to have Sandra, Jocke and Fiona as my teammates, they have all done this before. agilitynow.eu: Let’s stick on the World Championship topic. What are your personal goals? Is the focus just on collect some experiences or can we literally have a party? Enya Habel: Haha! This is probably not the answer you want, but actually my only goal this year is to just enjoy the atmosphere and be even more inspired by some world class agility! It’s impossible for me to go to a competition without doing my very very best every time, but I don’t have any expectations on results. Party is just 3 years old and we have never done anything like this so I will just seize the moment and really try to show Party from her best side. 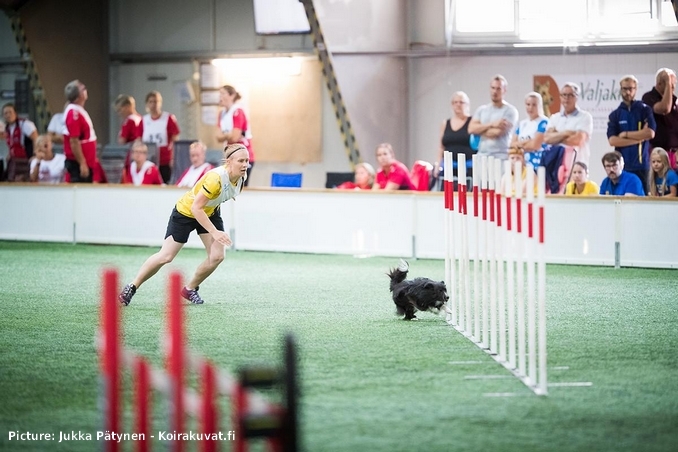 agilitynow.eu: The trend in agility sport is increasingly evolving towards as many movements and commands as possible. You and party are actually going the other way. You are known for your sleek and simple handling and that you put the emphasis on a well-trained dog. Is that a part of your success? Enya Habel: I would say yes! I think our sport will develop more and more towards the fact that you need a well educated dog to be on top. Some things are harder to solve with handling, the upcoming trends of traps and obstacle discrimination is just one of them. Partys foundation training was a lot about pushing her to her maximum speed. So if her education was built on me showing every obstacle I would probably not get her full speed since she would have to wait for me all the time. A dog asking takes time. So both yes and no. I don’t want to be lazy in my handling. I want to help her as much as possible but if I’m not able to reach the right obstacle, I want to be able to send her and handle her with verbal commands. agilitynow.eu: Another recipe for success is your incredible constancy. Those who know you know how meticulously you prepare for a run and how focused you are. How do you explain your strength in this area? 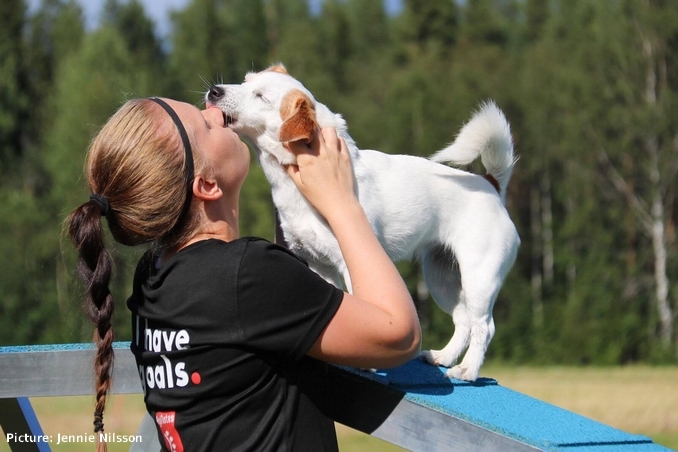 Enya Habel: I’ve been doing sports my entire life, both football and showjumping before I started training dogs. I learned that when it comes to pressure, it’s not enough that you can handle the pressure – you got to love the pressure. Talent is a word often used when describing successful teams. I believe in aptitude and hard work. I believe that the one who wants it the most and work the hardest for it will achieve it. Before every run I run, I tell my myself to be the one who wants it the most. 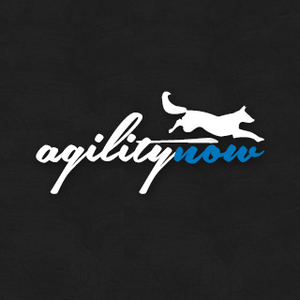 agilitynow.eu: You made your first steps in Agility with Jack Russel terrier Sydney. Currently you start with him in the newly introduced XS category, in which you could also celebrate the Swedish Championship title this year. Anyway, you are considered as a great proponent of this new categorys. But there are also other peoples that keep this class superfluous due to the small starting fields and the organisational effort which is required. Can you understand these voices a bit? What is your opinion about this development in Sweden and Finland? Enya Habel: First of all I think it’s cool that Sweden could lie at the forefront and be the first nation to introduce these rules. I hope five sizes can make the sport wider and open for a larger variation of breeds. Right now we have only had these rules for 2 years and with a little bit more time I hope the sizes can grow! agilitynow.eu: Even if your career is still quite fresh compared to the old hands, you have already gained a lot of experience during your career. So you were able to follow the development over the last years. The motto is always faster, more and more. Do you think that the sport is developing in the right direction? Enya Habel: Yes! Even if it wasn’t so long ago since my first competition in late 2011 I could see a big development in the sport since then. Especially dogs getting faster and more skilled! 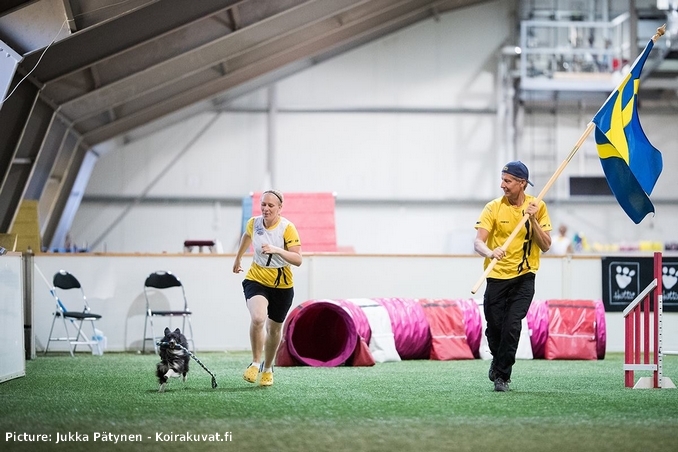 And also handlers training their physics and speed just for agility – Agility is actually turning into a real sport! I really like that! agilitynow.eu: How would you describe the character of your two dogs and how do they differ from each other? After all, the two races are quite different. Enya Habel: Oh they are like night and day compared to each other. Sid is this confident, tough primadonna with a lot of humor who would do anything for a small kibble. She always does first and thinks after, if something goes wrong she can do the same thing over and over again until she gets it correct. Party is this soft little thinker. She has really challenged me with her fragile soul and she can never repeat in training without overthinking it. She is this playful open dog with an extreme will to please. I have actually struggled a bit with motivation and speed in her foundations. Everything started with Jack Russel Terrier Sydney when Enya Habel was 16 years old. agilitynow.eu: Originally from Stockholm, you moved to Luleå, a small town in the north of Sweden near the Finnish border. There you offer courses and trainings on your own training course. Was the thought of your own place always a project you had somewhere in your mind? Enya Habel: Both yes and no. It has always been a dream but it would never have been possible without all the help I received from my partner Markus, who is originally from Luleå and the reason why I landed here. agilitynow.eu: Of course, the training place is also available for you and your dogs. Is a own training place today a must have to be able to keep up with the top? agilitynow.eu: When we’re already on the subject of training. What makes a good and successful training in the eyes of a Enya? Enya Habel: A good training is a planned training with both a plan A, B & C. I always want my dogs to feel happy and confident during our training sessions but it’s also my responsibility that my dog learned something and hopefully is a little bit more educated after the session then it was before. The feeling I’m aiming for is easy. If my training doesn’t feel easy I’m doing something wrong and I need to change something or go to my plan B.
agilitynow.eu: The change to Luleå to the north, however, also has some downsides. The most important tournaments are mostly held in the southern part of Sweden, in the metropolitan areas of Stockholm, Malmö or Gothenburg. For example you have to travel a distance of 900 kilometers alone to Stockholm. To Malmö it is even their 1’500 kilometers. So almost 16 hours of driving. This involves enormous time and costs. So, actually, curse and blessing right? Enya Habel: As you might figured out during this interview, hard work doesn’t scare me at all! When I lived in Stockholm I also traveled a long way for competitions. With a dog sized as Party it’s also very easy to fly from here. agilitynow.eu: Was the great distance also a reason why you renounced this year to compete at the European Open in Austria? Enya Habel: Yes and no. EO was the week after HulaHopp and a few weeks before the Nordic championships so the main reason was to give Party a rest and don’t push her to hard at her young age. Once you know your limits, you usually go further in the longer run. Sweden will be at the World Championship 2018 … hopefully medalists. For me, Sweden is … home. I would never … jeopardize my dogs safety. I look forward to this highlight every year … my birthday! I love birthdays. And Christmas. That’s what I wish for my sport … to keep developing the safety both in obstacles and courses. The 50 year old Enya Habel will be … having to many dogs! S. Trkman: RC with or without target? That is a cool interview. Good questions and fresh answers from Enya. ☺️ Good luck for the AWC! Du glömde att berätta om grenen på resultatlistan vid din första tävling,haha.